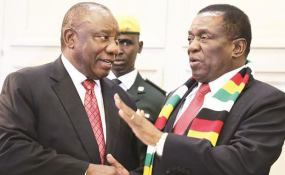 President Cyril Ramaphosa flew into Harare on Monday evening, ahead of co-chairing the Bi-National Commission (BNC) with his Zimbabwean counterpart Emmerson Mnangagwa. Relations between the two countries are conducted through the BNC, which was established in 2015. Ramaphosa's spokesperson Khusela Diko said they would seek to "strengthen mutual cooperation and deepen implementation" of 45 bilateral agreements. "South Africa and Zimbabwe are signatories to 45 agreements which cover a wide range of fields, including trade and investment, health, labour, migration, defence, taxation, tourism, scientific and technological cooperation, water and the environment," she explained. "In terms of trade, South African exports to Zimbabwe totalled R30.8bn, while imports from Zimbabwe amounted to R3.6bn." Ramaphosa's delegation comprises ministers of:international relations and cooperation, Lindiwe Sisulu;defence and military veterans, Nosiviwe Mapisa-Nqakula;finance, Tito Mboweni;trade and industry, Dr Rob Davies;home affairs, Dr Siyabonga Cwele;transport, Dr Blade Nzimande; andpolice, Bheki Cele. Deputy minister of social development, Hendrietta Bogopane-Zulu, is also part of the delegation. Deputy President David Mabuza will act as president during Ramaphosa's absence.